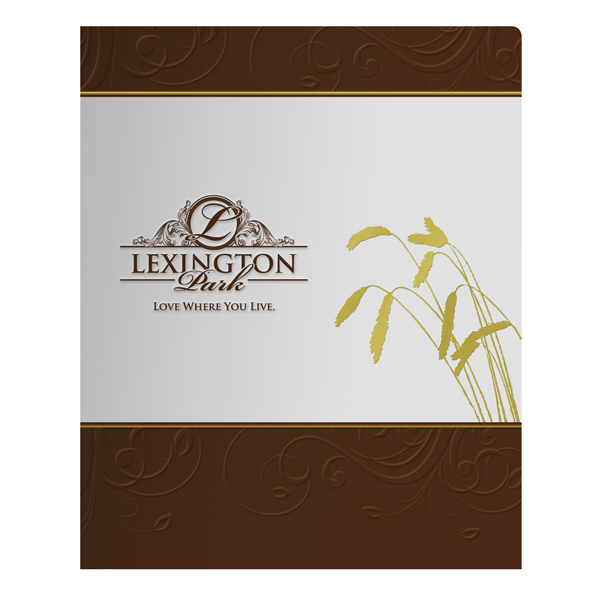 Custom embossing is a excellent way to give presentation folders and other marketing materials an elegant touch. As opposed to dry embossing which is sometimes done by hand by scrapbookers and craft enthusiasts, most commercial printers use heat embossing to squeeze and reshape paper into a customized design of your choice. 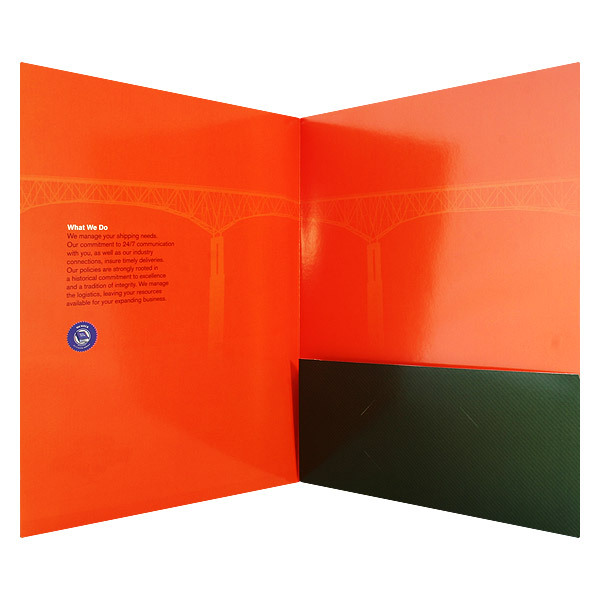 The process has some marked advantages over traditional folder printing: embossed folders are inexpensive, eco-friendly, and result in a subtle but distinctive look. Embossing can help to convey a sense of authority, since the end result is similar to the raised “seal” that you might see on an official document. It can also be used in conjunction with traditional ink printing or foil stamping for an effect that’s both visual and tactile. However, with these advantages come certain caveats and questions. There are several things you should keep in mind when embossing a pocket folder with a custom made design. Here are some essential tips to consider. Know your terms: blind, foil, or ink? Blind embossing isn't as noticeable as color printing, but it's perfect when you want a subtle, elegant look. Customers often have a tendency to confuse embossing with foil stamping. Some people hear the word “emboss” and immediately envision a shiny, metallic-looking design (similar to the Photoshop filter of the same name). But they’re actually very different concepts. An embossed design is simply “raised” from the printed surface, creating an effect that you can both see and feel. Foil stamping, on the other hand, is a printing method that’s frequently used to make designs appear shiny and shimmery. A folder can be both embossed and foil stamped, but you can also use either technique exclusively. Additionally, it’s possible to have a design with PMS or four-color printing on top of embossing, an interesting effect that blends ink with texture. When a folder is only embossed, it’s referred to as blind embossing. This is a great way to add a delicate, muted accent to your marketing materials. Be aware, however, that the design will essentially be the same color as the rest of your folder, so any text will require some effort to read. If you’re using this technique to print especially important information (such as your company’s contact info), it’s a good idea to also have the text printed in ink or foil stamped. Designs have a tendency to look smaller once they’ve been embossed on a custom made folder. For this reason, it’s a good idea to make the artwork you intend to imprint slightly larger than normal. Any lines in your design should be one point thick or greater. The same goes for any thin “gaps” in your design; if there’s an unembossed space between two embossed areas, it should be at least one point thick. Otherwise, these lines or areas might get lost. This is especially important when working with text. Avoid using fonts with very small, fine serifs or other small details; they won’t be as apparent once the design is imprinted. Embossed text written in a very small or thin font could end up looking very illegible. You also might want to add a bit more space between each letter than normal. 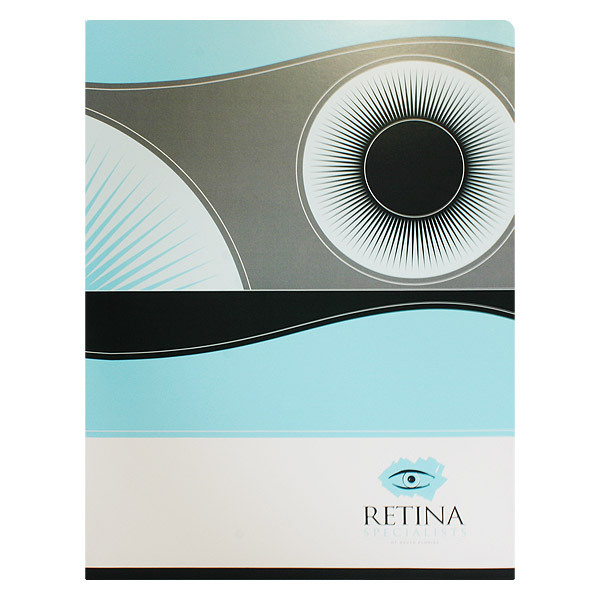 The elaborate design surrounding this folder's logo is sculpture embossed in a whorled, finely textured pattern. Because embossing introduces the element of depth to your pocket folder, it allows you to do things that just aren’t possible with conventional printing. There are a variety of special techniques that you can use to customize the look of your design. Bevel embossing adds a bit of an “arc” to the way your image protrudes off of the paper. It can be used to give a logo or text a more cushiony, curved look instead of the sharp plateau-like effect you get with normal embossing. Multi-level embossing, like the name suggests, places your design on multiple levels of depth. Imagine a wedding cake, with multiple layers placed one on top of the other. When you want a section of your embossed logo to be higher than the rest, this is the method of choice. Sculptured embossing is similar to multi-level embossing in that it involves multiple levels of depth, but it adds even more detail with many variations in height, similar to a relief painting. This is a tasteful technique that’s great for larger design elements (such as an elaborate logo or picture) that you’d like to have a “natural” texture. You should also feel free to use embossed printing in unusual ways. It’s common to emboss the front or back of your folder, but don’t disregard the inside. A unique raised design on the pocket of your presentation folder could be a pleasant surprise that grabs the attention of your recipient. Embossed designs and light, flimsy stocks don’t mix very well. Thin stocks have fewer fibers, which means they’re more likely to tear and have less capacity for stretching. This limits the maximum depth of your folder’s embossing. Heavier stocks (100 lb. or more) usually work best when you want a crisp and deep embossed pattern. Visibility is definitely not blind embossing’s strong suit. Be aware that your folder logo will be even less visible on stocks with a flecked/speckled pattern, since they make shadows harder to see. The true strength of embossing is the texture it creates; a noticeably textured stock (like linen or felt) or coating (such as satin or soft-touch) will encourage recipients to make use of their tactile sense. Embossing is one of the more versatile printing methods available because there are so many different ways of utilizing it. This versatility also means that there are many factors that you should take into account when designing an embossed pocket folder. Keep these tips in mind, and your folder design is sure to become an embossed masterpiece. I like how you said that you should use embossing in unique ways to create something that is yours. Using this kind of decoration for folder inserts could also help to create something that looks professional and unique. When presenting it would be good to show that you are detailed and like to make things nice.